MADRID (AP) — Real Madrid says work to remodel Santiago Bernabeu Stadium will begin at the end of the season. The new-look Bernabeu will also have a 360-degree video screen and a new seating section, though its capacity is expected to remain at about 80,000 people. 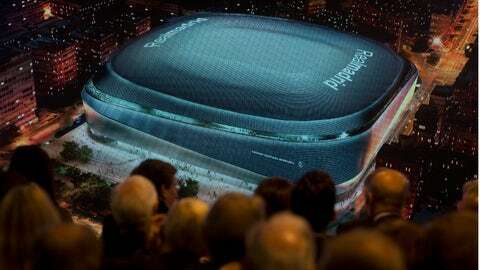 “The new Santiago Bernabeu will be the best stadium in the world,” Real Madrid president Florentino Perez boasted on Tuesday. The reconstruction will last three to four years. The club said the work will not affect the team’s home fixtures, as most of the heavy work will be done in the offseason. The corner access towers, one of the stadium’s most notable features, will be covered by the new steel facade when work is completed. Real Madrid had tried to remodel its stadium several times but earlier projects were turned down by the city and court decisions. The club wasn’t allowed to increase the total size of the structures already in place so it had to rearrange the current constructions, transferring some office spaces to the team’s base in Ciudad Real Madrid, in the city’s outskirts. Madrid first started working on the stadium project in 2009. Three years ago, the club said the goal was to finish the new stadium by 2020, with a cost initially estimated at 400 million euros ($450 million). Perez said that since 2000 Real Madrid has invested more than 250 million euros ($280 million) in the stadium, which was inaugurated in 1947.